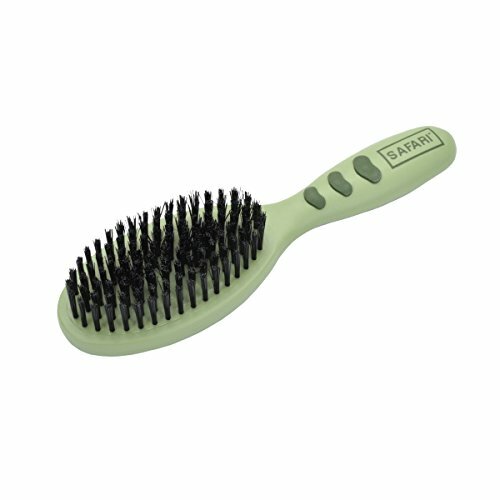 Featuring a New easy grip plastic handle, our Safari Bristle Dog Brush is designed to clean and shine your dog's coat. For short coats, use small, quick strokes, angling the dog brush to remove dirt and debris from the dog's hair. To distribute natural oils and add shine, use long flowing strokes working from the dog's head to tail and down legs. Always brush in the direction of hair growth. If you have any questions about this product by Safari Pet Products, contact us by completing and submitting the form below. If you are looking for a specif part number, please include it with your message.